In the meantime, I want to give a great big THANK YOU to my Bible study ladies who had a birthday party for me and another BD gal on Tuesday. There were pretty decorated party plates and a homemade super-yummy German chocolate cake with that incredibly delicious homemade gooey coconut icing. (Swoon!!!) That's my absolute favorite kind of cake!!! (Kathy, you are amazing!!) There was yummy Tillamook Vanilla Bean ice cream (Sharon, you didn't even know this for you, too!! hehehee) and toasted almond slivers and Almond Joy M&Ms to go with it....or by themselves....I had them both ways! Ha! Look what they gave me!!!!! Such lovely cards (one with chickens....I LOVE my sweet chickens!!! 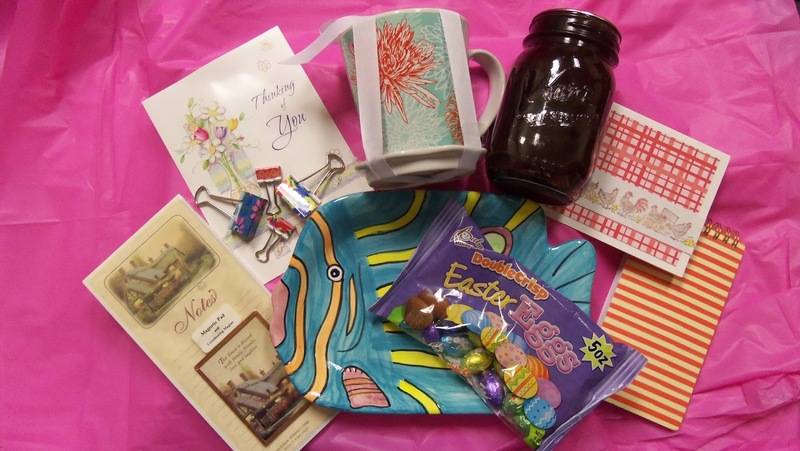 ), the most colorful and festive fish candy dish WITH chocolate Easter eggs to go with it (YUM! ), some lovely notepads---one magnetic with Thomas Kinkade paintings (so gorgeous!) and one spiral that is reversible (blank unlined pages and so you can use it from the front or from the back....The back has a BD confetti pattern on the cover! ), and the most adorable and pretty clips I think I have ever seen, some of the most delectable homemade and home-canned jam from home-grown raspberries (scrumptious!!! ), and a super-cute coffee or tea mug with its own coaster or cover (lovely colors and flower on this set!!). THANK YOU SO MUCH!!! You each will be receiving your own personal thank you card from me, but here is a sparkly THANK YOU for the whole group to tell you each how much I love and appreciate you!!! You bring so much happiness and sparkle into my life. Thank you for the lovely party and for the super-sweet gifts and thoughts. You ladies are the best!! Thank you to everyone far and wide for visiting my blog. I have had visitors clear from Australia and Ireland and Poland (and several other European countries) as well as the U.S. and Canada. I am so thrilled. Your comments really mean a lot to me!!! Have a lovely day! And don't forget the giveaway that I will be posting next week!! Next meeting is Tuesday, March 4, 1 pm at the church. I am hoping Sharon will be sharin'....(little pun there!) about making paper flowers. See you all there!!! What do your cats do to get you out of bed????? Today I am sharing a sweet and simple card. I am entering this in the Great Impressions February Floral Images Challenge. 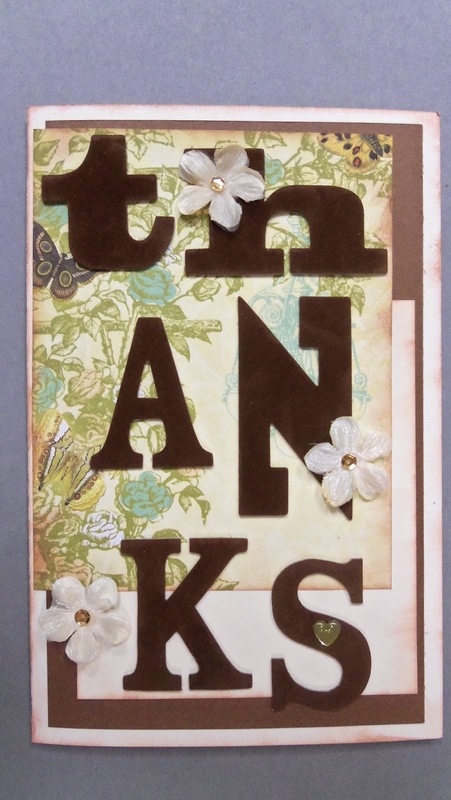 I made this card to thank Great Impressions Stamps for sending me these lovely stamps in a prize. They were extras that I was not expecting. Aren't they just adorable???? I think the Pocket Full of Posies (#H229S) (that is MY name for it, not one that was on the package!) might be discontinued, but the Large Hello stamp is still in their online catalog. 2. Next I stamped my pocket image over the splatters using my Staz-On Jet Black Ink Pad. 3. 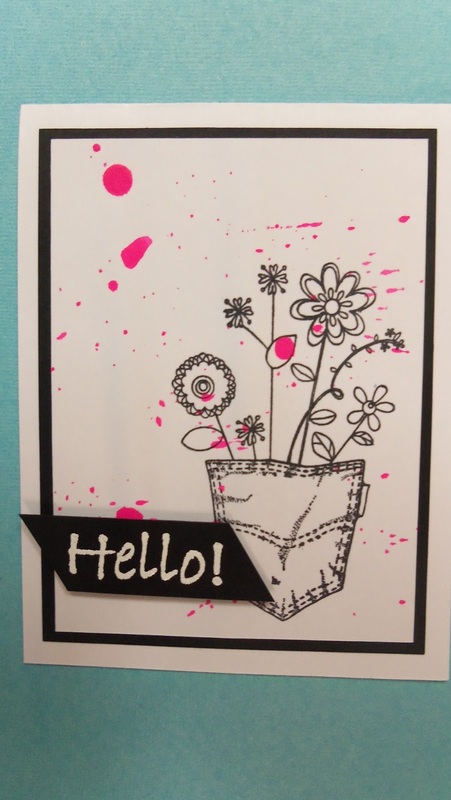 Next I stamped my Hello image and heat-embossed it in white on the black cardstock. Then I trimmed it into a banner shape and set it aside for a few moments. 4. I matted the white card front onto black cardstock and then mounted it all onto the white card base. 5. Lastly, I mounted my Hello banner on my card front with Scrapbook Adhesives 3D Foam Squares in black. 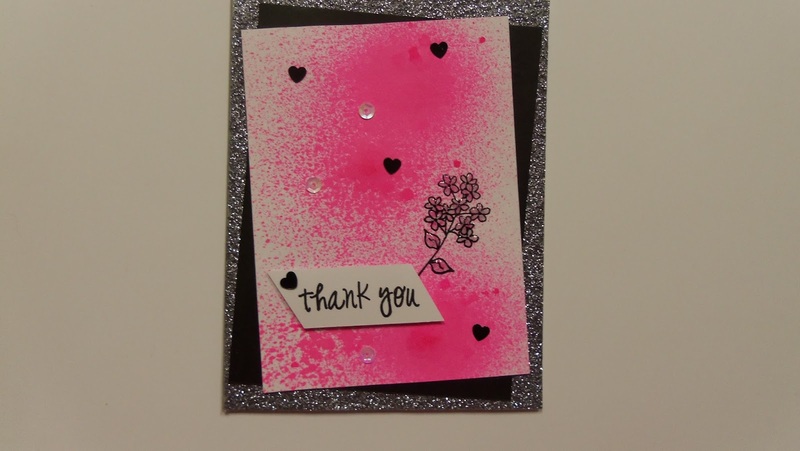 I'm glad I kept to the black and white with bright pink accents for this card. I think it really lets the pocket and floral details in this super-cute image take center stage. That's all for this morning. Have a glorious day!! 1. House of Cards: February Challenge #2: Color and/or Photo + CAS or Classic Inspiration in the CAS class. I also linked this up to the Great Impressions 2014 Customer Gallery. I made this card to enter in the Verve Perk Up February Diva Dare. 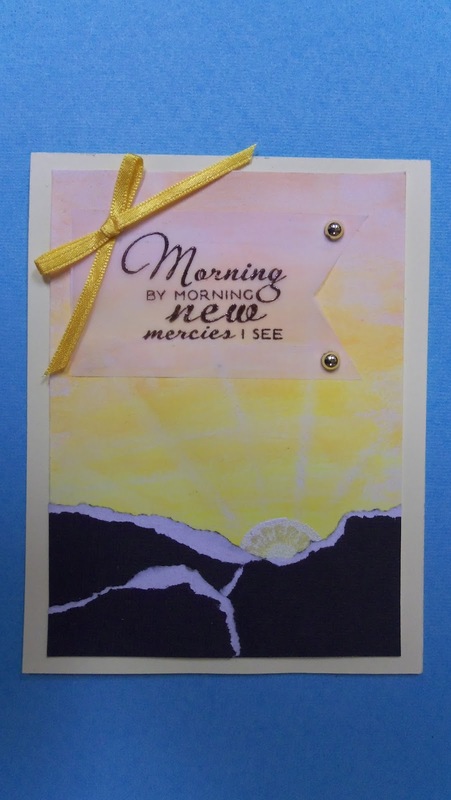 The sentiment and sun are from the Verve New Mercies set that I won from Verve last summer. THANK YOU!!! Looking at the sentiment, I knew I wanted to make a sunrise....something I had never tried before!! Yikes....scary! 2. I stamped the sun reversed (so the little sun pattern was the side stuck to the acrylic block) and heat embossed in white to get a solid brilliant ball. 3. I turned the stamp the correct way and stamped the sun pattern directly on top of the embossed white ball and heat-embossed the fresh pattern with Stamp n Stuff Sahara Pearls-translucent, being careful not to overcook! 4. I rubbed some Butter Cream Gelato over the sun disc with my finger to make it a bit more golden. 5. To make the rays in the sky, I took a Q-tip and dipped in water and streaked it upward from the sun. Then took the dry end and wiped the same moistened paths immediately afterwards. This picked up some of the pigment, leaving the rays. LOVE how this turned out!! 6. I tore dark brown DCWV cardstock to make the snow-ridged mountains (Thanks for inspiring me to try tearing, Christy!!) 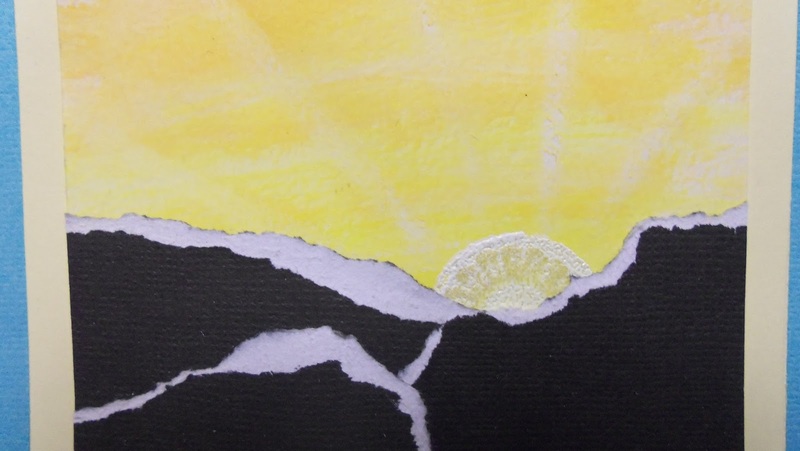 and pieced them together for my landscape with the sun peeking over the edge. Then I glued them down with a generous amount of Scotch Craft Stick. 7. I stamped the sentiment on vellum with Distress Ink in Walnut Brown and heat-embossed with Stampendous Clear Bark embossing powder. Then I trimmed it to a banner shape. 8. I adhered the vellum with Scrapbook Adhesives E-Z Runner Vellum which works like a dream to glue vellum down nearly invisibly! Thank you, Beth Pingry, for recommending this awesome product to me and including it in a prize package!! 9. 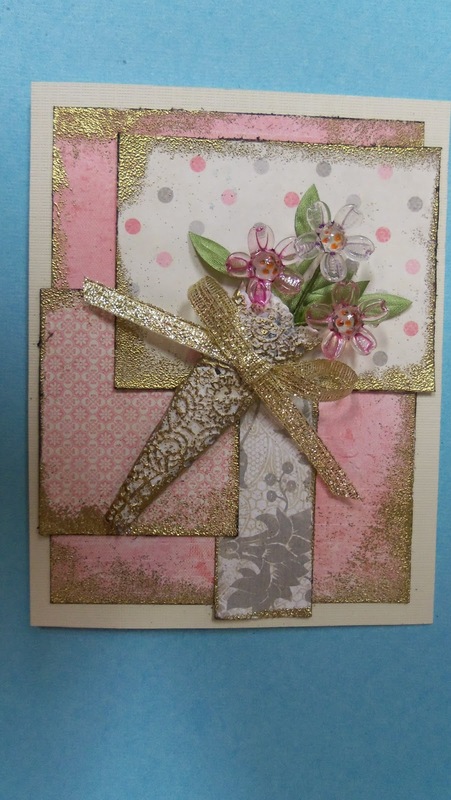 I finished the card up with some gold dots from Studio 112 and a gold bow. Then I mounted it with Scrapbook Adhesives E-Z Runner Permanent Strips on an ivory card base. Again, I have a card with subtle coloring that my camera hasn't yet *developed* an appreciation for! I am delighted with how this turned out, though, because it is pretty close to what I had envisioned. Yay!! What do you think? Should I stick to doilies and lots of layers???? :) I really appreciate your comments!!! Today I am sharing a card I made a few weeks ago for my next-door neighbor who is recuperating after falling on the ice and breaking his ankle in two places. Ouch!!! I hate to admit this, but he said it happened when he was reaching down to pet one of my cats, Scooter. Oh, that made us feel even worse!!! He said she didn't trip him, he just over-reached and slipped. Since this was a card for a man, I put away my ribbons and doilies and got out some cool stencils, instead. I won this amazing set from Artistcellar designed by Jill K.Berry called: TEXTures 2 and this is the Gera design. Cool, huh? THANK YOU, Artistcellar!!! I taped my stencil over some patterned cardstock from my stash that had a design I wasn't really crazy about. By stenciling, I could cover it up mostly, but still have the pattern subtly showing in the lines of the design. Yay!! With the stencil taped in place with Washi (so I could easily remove it), I inked over the cardstock with several colors of coordinating small pigment inkpads in my stash (blue, gray, purple, and a cheap white that is actually more cloudy than white!). After removing the stencil, I sprinkled clear embossing powder over the whole thing and turned my heat gun on it. Love how the pigment inks blended into each other as I smoothed the pads over the stencil. I also love how the glossy heat-embossed parts have a bit of texture themselves. The sentiment is a discontinued clear acrylic stamp set called Scriptures of Peace (#50277) from Clear Dollar Stamps, before they switched gears and went to all digis and cut files and switched names and what all. You might still be able to find this set on eBay, if you are lucky. I use it a lot!! I stamped it on a piece of navy cardstock and heat embossed it with silver embossing powder, although it doesn't look very silver in this photo. Gotta work on my photography!!! I mounted the sentiment piece on some kraft cardstock and cut the edge with some manly-looking decorative scissors......because I couldn't keep from dressing it up a little bit! Ha. I thought this simple cut was just right. What do you think? It was really fun using my stencils for this card. I have another set I won also that I want to play with soon! 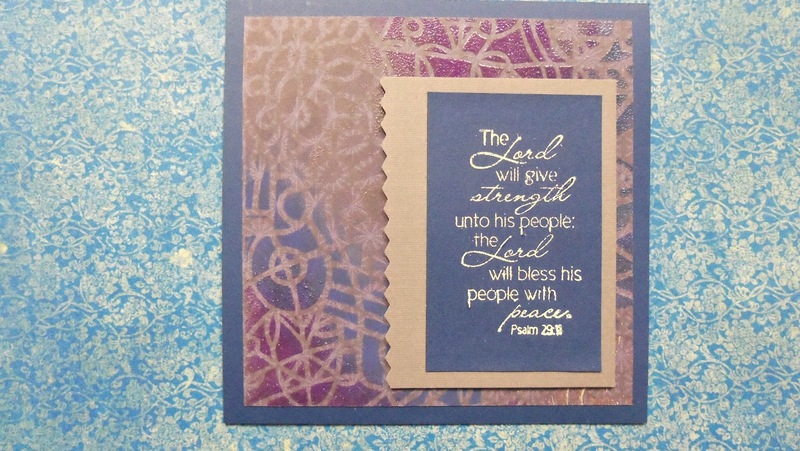 Do you make stenciled cards? Thanks so much for coming to visit my blog. Have a lovely rest of the weekend!!! What are the cats doing right now????? What are your cats doing? Hello to each of you!! This afternoon I am posting a card I sent to Sabrina Alery thanking her for the super-duper box of stash prizes she sent me a while back. If you haven't visited her blog: The Honor Roll, you really should stop by. She has wonderful projects and tips. I wanted to make a thank you card using items she had sent me. As you see, my photography is quite poor here, but I hope you get the idea! I absolutely loved this paper she included and built the card around it. I hardly ever use big alphas, but I made the plunge and used these luscious velvety flocked chocolate letters for the greeting. So glad I did. It's good for me to stretch and jump out of my cat bed sometimes!! I used these yummy Prima flowers she sent me, also. All in all, this is a very different style for me and I was surprised at how much I liked it. What are the cats doing right now??? Everyone seems to be dozing peacefully. Whew! This morning I came into the kitchen to find the drawer holding the plastic wrap and foil etc. pried open about 8 inches. Fortunately, nothing seemed to be torn up. Andromeda was probably the culprit! Thank you to everyone who has visited my blog yesterday and today. I really appreciate it!! This is all so very new to me. I appreciate each one of the kind comments. I am also full of questions, so I might be contacting some of the bloggers who have been sweet enough to stop by! 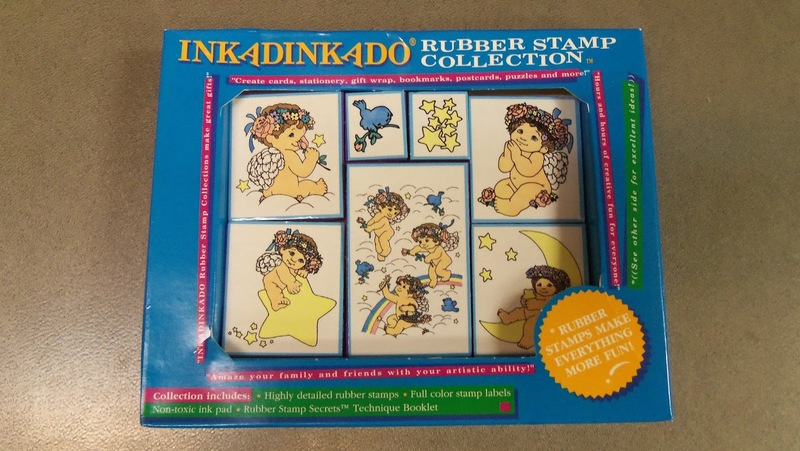 I dug out an ancient set of Inkadinkadoo Dreamsicle stamps that have been in my stash for years and I had never used!!! With these precious images, I had the idea of stamping them on vellum and heat embossing with white embossing powder. I wanted soft colors so I pulled out my cheapo plastic palette and used Gelatos of the desired hues. I scribbled the Gelatos in individual wells and misted a bit of water in the larger center well of the palette to wet my brush. I love how delicate the colors turned out!!! I traced the inner circle of a 4" round doily on vellum (Corrie, I am finding these doilies indispensable!!) and cut it out so it would fit inside the doily frame. With the heat embossing and the watercoloring, the vellum wasn't lying as flat as I wished, so I got out my Xyron 3" Sticker Maker that I won from Xyron. THANK YOU!!! 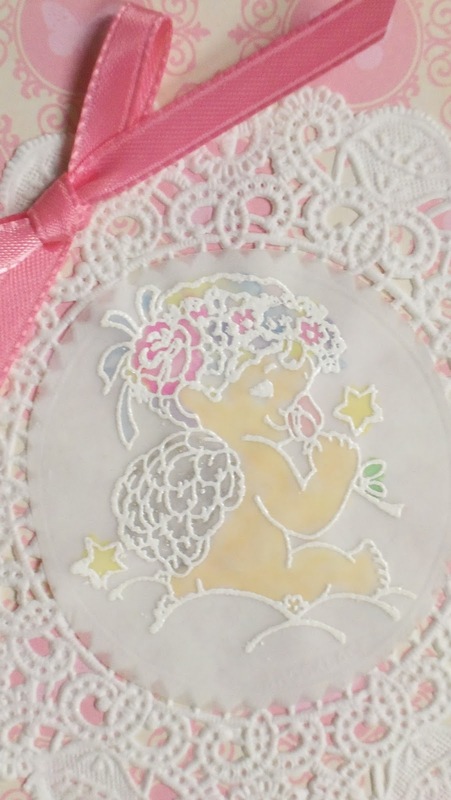 It was a breeze to turn my vellum image into a sticker that would adhere smoothly to the doily. You can see that it still buckles a bit, but I am satisfied with it. I mounted my doily frame and image on some DCWV Butterfly Garden patterned cardstock (that I had pre-folded and edged with some scallop scissors) with TomBow Aqua Mono Liquid Glue. I like this clear glue for items that are lacy or lattice-like. 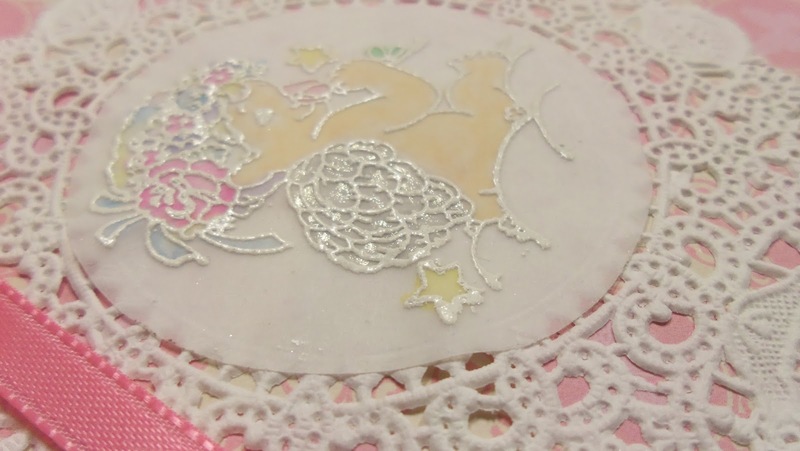 It dries clear and doesn't stay sticky in between the narrow parts of the doily design. Next, I wanted the wings to shine and sparkle a little more, so on the mounted image I colored them in between the lines of embossing with my Sakura Gelly Roll Stardust Clear pen. It gave just the right amount of sparkliness. I don't know if you can see it in this angled picture or not. Next I added the pink bow at the top upper left, but wanted a little something at the lower right for balance. 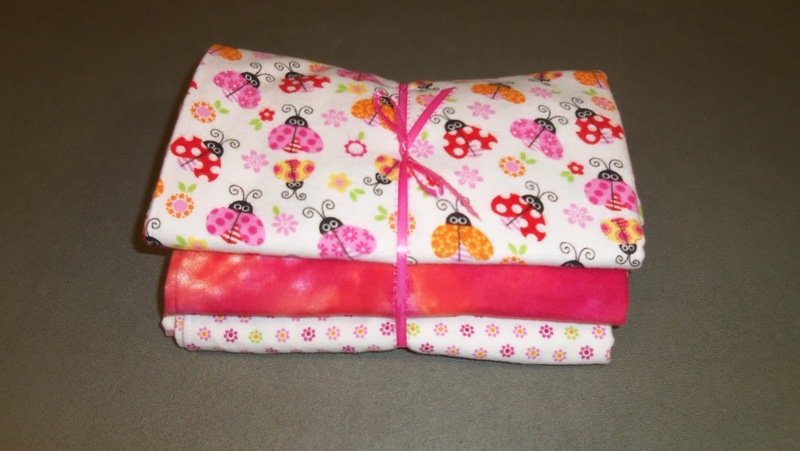 I didn't want something very big or conspicuous that would overwhelm the softly colored image, so I opted for one of the lovely Prima Fabric Fancies opal flowers that Sabrina Alery sent me as part of a humongous prize. (THANKS, Sabrina! I have reached for these flowers over and over!!!) I wanted something special for the flower center, so I dug out some absolutely gorgeous pearlescent Mill Hill glass seed beads I had found at a thrift store. I think that about covers it. I love how this turned out. I am delighted with the very delicate colors that painting on the back side of the vellum gave me. Would you like to see what I made for the baby, too????? Wow.....this was a LONG post!! Congratulations if you made it all the way through! Thanks for stopping by. I would love to hear what you think about my projects and would appreciate any helpful hints!!! One of the reasons I wanted to get this blog up this month was to enter the Glitz Designs Monthly Challenge for the Pink, Neutral, Silver, Gold theme. This is pretty scary because I have never photographed anything for posting on the internet before. Also, I have never entered a challenge before. But I need to get my feet wet sometime, right? The rules stated that you needed to use at least 50% Glitz product on the card, which I did. The pink panels are from the Glitz Love You Madly 6 X 6 Paper Pad and the neutral and silver panel is from the Glitz Sunshine in My Soul 6 X 6 Paper Pad. Both of these were part of a lovely prize I won from Glitz. THANK YOU, Glitz!! This card measures 4-1/2" x 5-1/4". 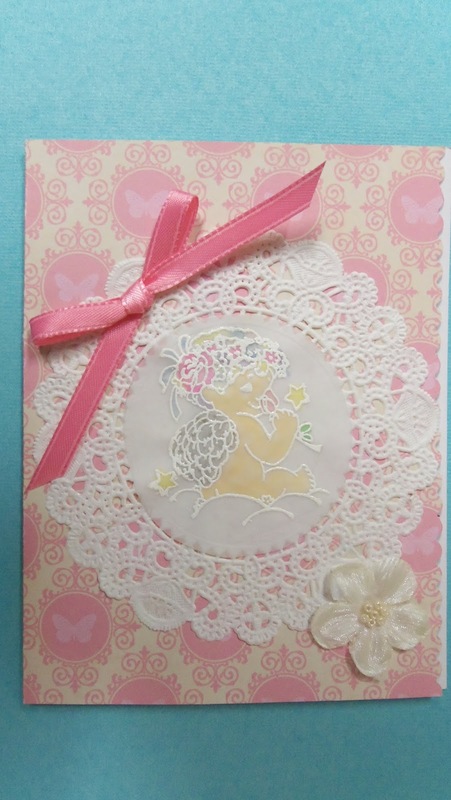 I wanted to make this a shabby chic kind of card so I pulled out my doilies and my pretty papers. Instead of only inking the edges of the panels, I decided to gild the edges by rubbing them against my glue pad (after distressing them) and coating the edges with gold embossing powder. After zapping them with my heat gun, I distressed them a bit more and then inked the edges with a Distress Ink Pad in Walnut Stain color. Next I mounted the panels on an ivory piece of cardstock from my stash. I had been itching to use these amazing glass flowers I had picked up in a thrift store and thought this would be the place. I calculated how long I wanted my doily cone to be and cut about an inch off an edge of a 4" round ivory doily (thank you, Corrie!!) and rolled it up. I attached the free edge to the main body with Glue Dots and then gilded the side that would show by the same method as I used for the panels. Next I chose the glass flowers I wanted and cut their stems to length. I put a Glue Dot inside the cone to secure the flowers initially and then arranged my leaves made from some strips of lovely ribbon that I won from May Arts. THANK YOU, May Arts!! I secured everything inside the cone with Tombow Mono Multi-purpose Liquid Glue, which I bought because it is so highly recommended by many crafters! It really is good. I use it when I need a liquid glue that will really hold. 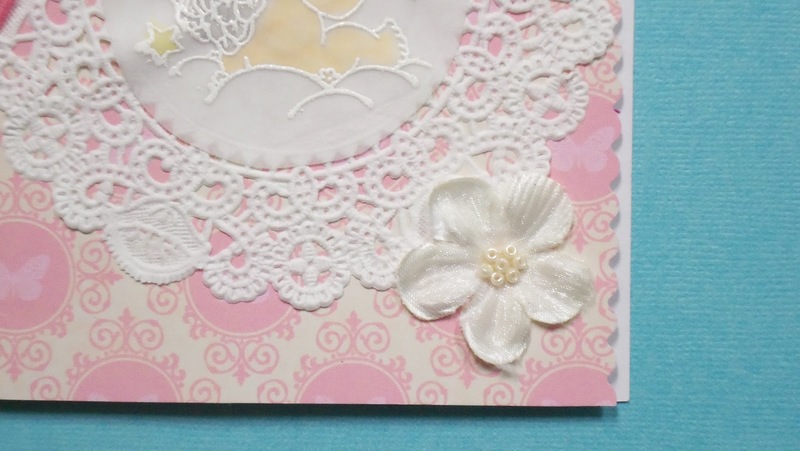 Then I adhered my cone of flowers to the card front with more Glue Dots. I don't know if you can see my flowers and leaves any better in this angled shot. But you can enlarge the images by clicking on them and then right click then click again on "View Image".....at least that works for me on my computer. I hope you can see the details on these because I am just crazy about these flowers! 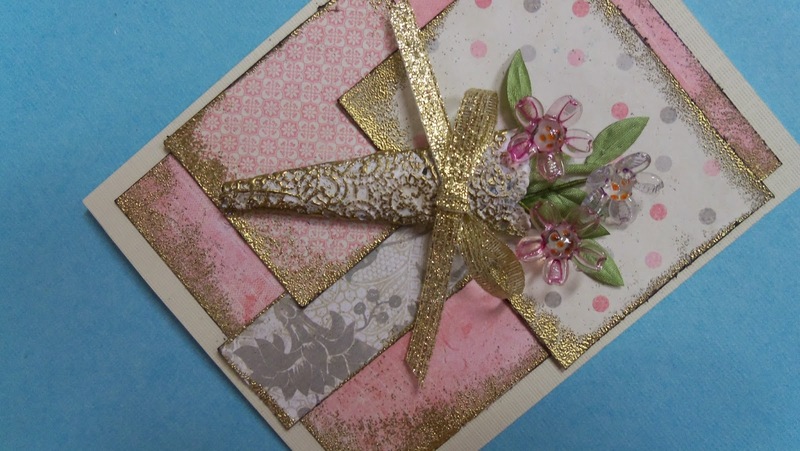 I finished off the card with a shimmery gold bow of Offray metallic gold 1/4" ribbon, which I buy at Wal-Mart. I am really happy with how this card turned out. Hope you like it, too. Please leave comments and/or questions below. That way I will know I am not talking only to myself!!! Welcome to my blog. I'm so glad you have come to visit! Since I am brand-new at this sort of thing, you will have to be patient with me as I learn by doing! My intent for this blog is to share with you crafty projects (mostly cards!) that I have made and to let you know about special craft items I have discovered. Also, I hope to share craft blog prize opportunities that you can be a part of, including ones that I have entered and maybe won!! I will also use this blog to keep the local ladies' craft group I am part of informed about upcoming meetings and activities.